We had the most amazing Princess-y Party yesterday. Eight girls dressed in the princess best come over for a Halloween Tea party! I am still giddy about it. They were enchanting. but these mini white ones are magical to me! I have tattooed pumpkins before and love this technique. so that is why I continue to use them. from amazing sources like The Graphics Fairy. BUT it has been UPDATED! You just need Temporary Inkjet Tattoo Paper/Kit - You can buy TEMPORARY INKJET TATTOO PAPER many places. Usually you get1-2 sheets per pack (You need one sheet of printable paper and one sheet of adhesive for each project). Decide on a design. For this project I simply used French Script from my regular old fonts and enlarged it to my desired size. But is you can (legally) download it, you can print it! Print it out using your computer and printer. FOLLOW THE DIRECTIONS AND PRINT ON THE SHINY SIDE AND BE CAREFUL AS YOU HANDLE IT....IT NEEDS TO DRY THOROUGHLY. NOTE: If you are printing names or for most images - be sure to use the MIRROR Image option so the final product is exactly as you imagined it would be. After the print has dried thoroughly, apply the adhesive. Remove the solid side of the adhesive backing and line up the edges of the printed sheet and adhesive. Smooth adhesive onto printed sheet. I used a credit card to firmly push out the air bubbles and get good adhesion. Cut out the design - with your scissors. Remove the clear backing from the adhesive when yo are ready to apply. It will be sticky once you do this. Position the tattoo and rub/push into place. Apply a moist cloth to dampen the tattoo and get the tattoo to stick (just like those temporary tattoos the kids get at parties). After about 20-30 seconds the top paper (the actually backing of the printed sheet) will loosed. If it is not loose, reapply the moist cloth/paper. If some parts are sticking up, loose, not completely adhered, I was able to use my finger lightly to smooth things out. Fun for Halloween...or heck all Fall long! The wood flooring arrived last night long with all the tools necessary.. and I was making candles to boot. Thank goodness there's only 1 pumpkin to be carved this year and the rest.. well you got it.. spray paint and now tattoo's! Yippie skippie do! Holly, what is that font you used? Such a great idea! Glad your princess party was a big hit. I sure everything was beautiful. I seriously love this project! And Halloween Tea Party? SO clever! 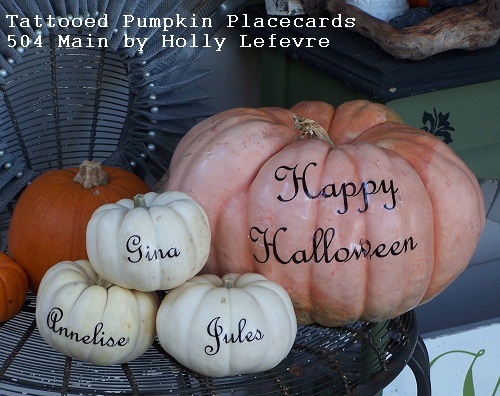 I love that idea ... the pumpkins look amazing! I would NEVER have thought to use tattoo paper like that! How awesome are these! Great idea to use tattoo paper! Holly I love these! 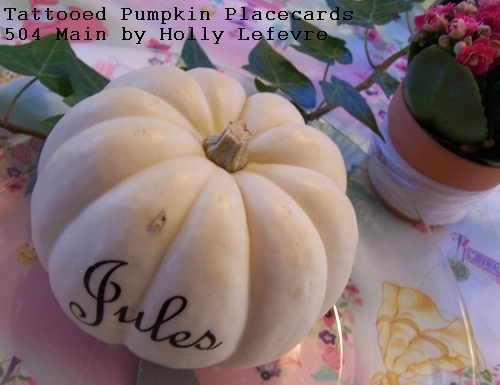 My kids would think these were pretty special -- think I just might steal your idea for our table! Thanks! These are so cute Holly! What a great idea! I never thought of using tattoos on a pumpkin before. 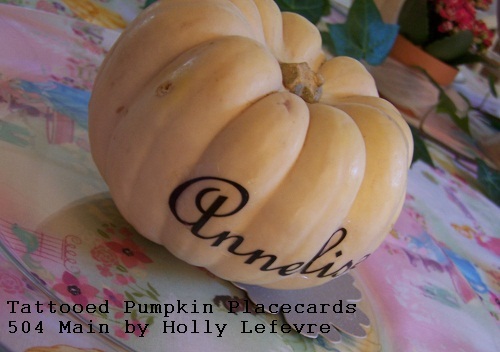 I love the idea of using them for placecards. I think I may try this one for Thanksgiving this year. Thanks for the idea. I'm stumbling and pinning this one.